Christmas morning was always the most anticipated day of the year in our family when I was growing up. My mom would start cooking breakfast early in the morning so that it would be ready when everyone arrived. It’s no wonder that when I think of Christmas morning, I think of the colorful Christmas tree, presents stacked high and the yummy breakfast foods my mom would make. 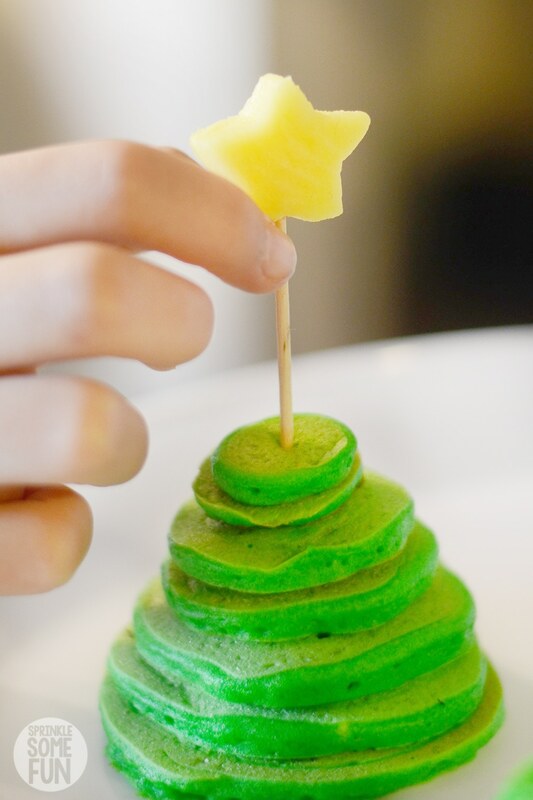 Delicious Christmas Tree Pancakes are colored green and stacked to look like a Christmas tree! The colorful sprinkles look like little ornaments and a mango star completes the Easy Christmas Breakfast Idea! Christmas Tree Pancakes recipe has been compensated. All opinions are mine alone. 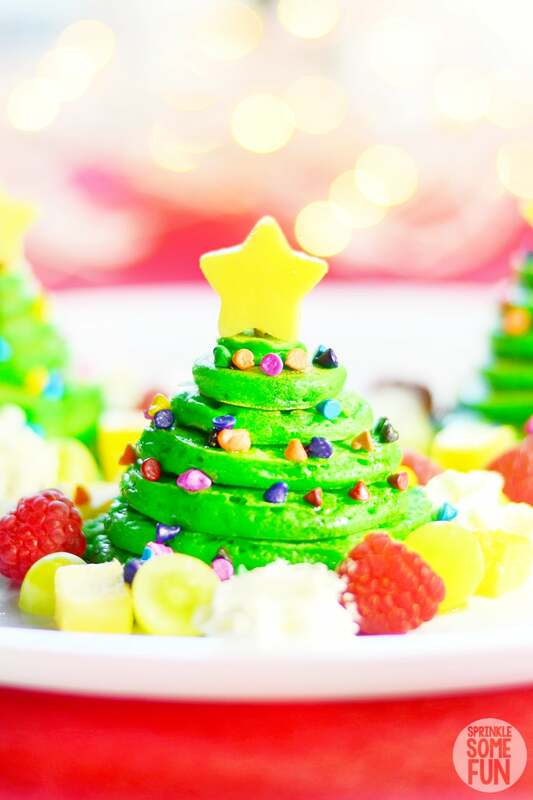 We don’t wait until Christmas day to make these fun Christmas tree pancakes. We make these often during the Christmas season because they are so cute and festive. It’s also a great way to spend a Saturday morning around the table. One thing I like most about the holidays is being together with my family and making holiday themed treats. Plus, I love seeing my kids decorating their own creations. 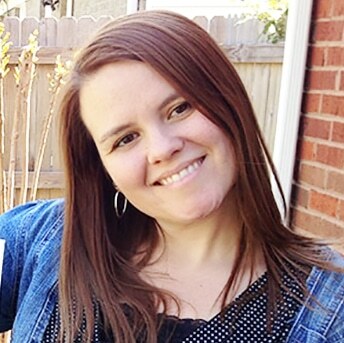 Creating recipes as a family helps to make the holidays so much fun! These festive pancakes have definitely been added to our list of holiday food traditions. I like to think that maybe my kids will continue this tradition with their own kids someday too. To add a little flavor to the pancakes I added some almond extract to the Aunt Jemima pancake batter before cooking. I have to say that they were the best tasting pancakes I have ever made. They cooked up nice and fluffy too! Making the bright green color for the pancakes took a lot of drops of regular water based green food color. Use gel food colors or icing food colors that are more concentrated for the brightest green color. You may not want them as bright as we made them and they do look fine at a lighter color as well. Use your griddle on a lower heat setting for the best color results and be sure to flip the pancakes as soon as they start to bubble. It takes a little longer to cook if you heat them at a medium-low heat, but the color results are worth it. If you cook them at a higher temperature the outsides will turn more of a brownish green color. My favorite griddle is the one I used here from Amazon (affiliate). It’s easy to control the temperature with this one and also make a lot of pancakes at once! Plus, the ceramic coating really works great. Try adding different flavors to change it up a bit. Use different flavors of the season like almond, peppermint, cinnamon, hazelnut and more. Of course, don’t use them all at once! Try them one at a time to see which one you like for these. 1 tsp. should be enough to flavor the whole batch. The little yellow star on top was made with a 1/2 inch thick piece of mango I sliced and then I used a small star cookie cutter to cut out the star. I did use a toothpick to secure the star on top, but if you have small children I would leave this off because the toothpick could be a choking hazard. Find the star cookie cutter I used here (affiliate) as a part of a set. You can use any 1/2 inch star cookie cutter to get the same look. 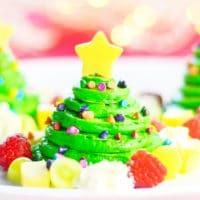 Get the best Christmas tree “look” by using around 6-7 pancakes that are in graduated sizes from 4 inches to around 1 inch in diameter. It’s up to you how you want to cook your pancakes, although, I think it’s easiest to cook each size pancake together. For example; if I make 4 stacks I would make all four 4-inch pancakes at once and then go on to the next size. Use colorful candy coated chocolate sprinkles (affiliate) to look like Christmas ornaments. Alternatively, there are many Christmas shaped sprinkles that would also be super cute. I know my kids love having lots of sprinkle options to choose from. I went ahead and decorated the first batch myself for this pictures, but I suggest leaving the stacks undecorated so that the kids can add their own sprinkles and fruits. Most kids love to decorate their own trees and pick out their own fruits. In fact, adults might love decorating their own too! These turned out super cute and perfect for any holiday occasion. If you are wondering how many of these to make; I suggest 1 to 2 per person (2 only for big eaters). One stack of pancakes filled each of us up quite well! 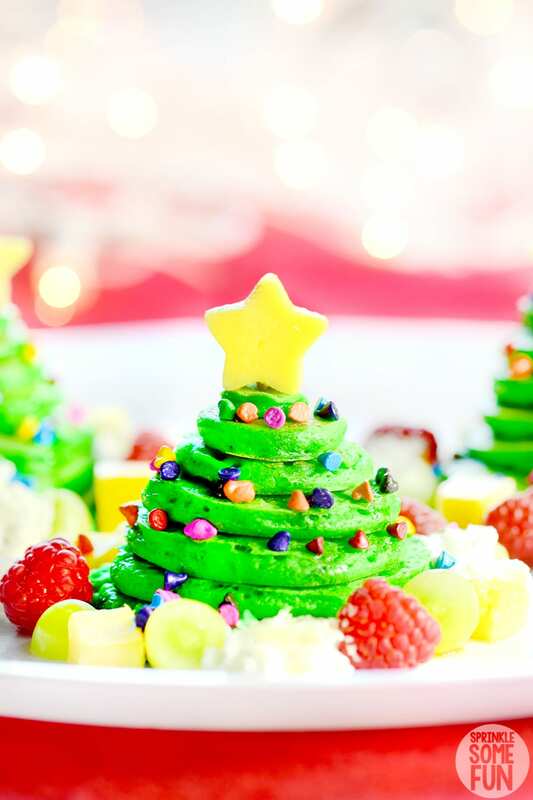 Christmas Tree Pancakes are a go-to easy Christmas breakfast idea we will be making again and again. What fun holiday traditions and foods do you like making for the holidays? If you LOVE this Christmas Cookie Kit baking gift, be sure to stop on over in my Pinterest Community to share a picture of YOUR completed pictures! Or share it on Instagram and tag me #sprinklesomefun so I can see it! 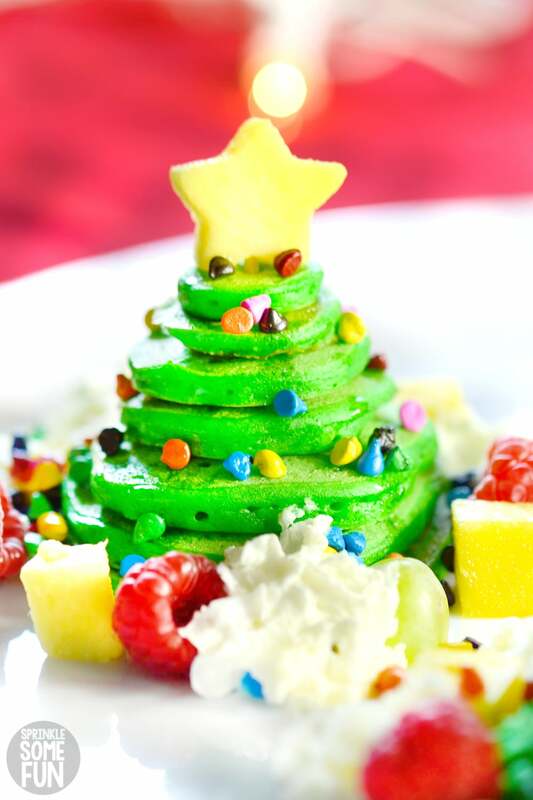 Christmas Tree Pancakes are colored green & stacked up to look like a Christmas tree! Sprinkles and a star complete this easy Christmas breakfast idea! Preheat Griddle to medium high heat (around 325 degrees). Make 1 batch of Pancake batter according to the back of the Aunt Jemima Pancake and Waffle Mix (from the back of the box). 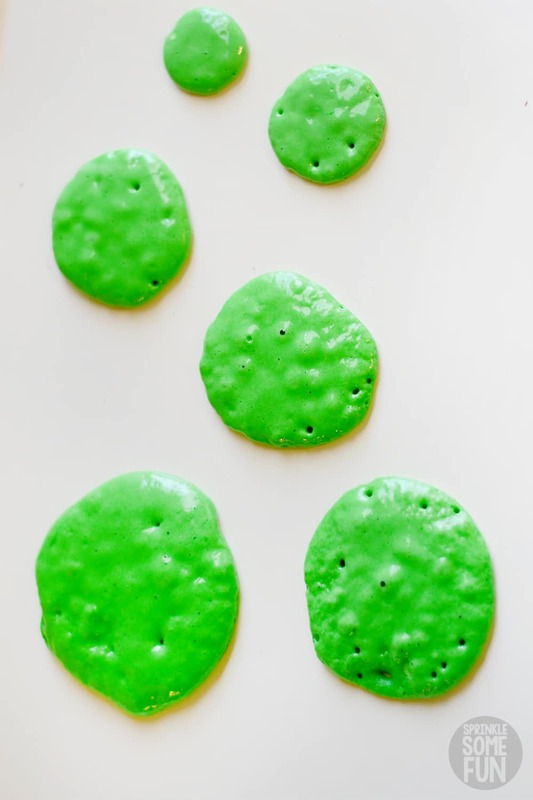 To that add the almond extract and a few drops of green food coloring until you achieve the desired color. Put batter into a squirt bottle or a cup/ bowl with a spout. Each pancake will be a different size starting with a pancake that is around 3 inches in diameter. Slowly squeeze or pour out batter onto the griddle making 6 to 7 pancakes that decrease in size from 3 inches. The last pancake should only be around the size of a penny. Flip the pancakes once when the batter begins to form bubbles and remove them once the other side is starting to brown (around 45 seconds). Repeat this process for each Christmas Tree Stack. Recipe makes 3 to 4 stacks. Assemble the trees stack the pancakes starting with the biggest to the smallest. Eat as is or add the garnishes. 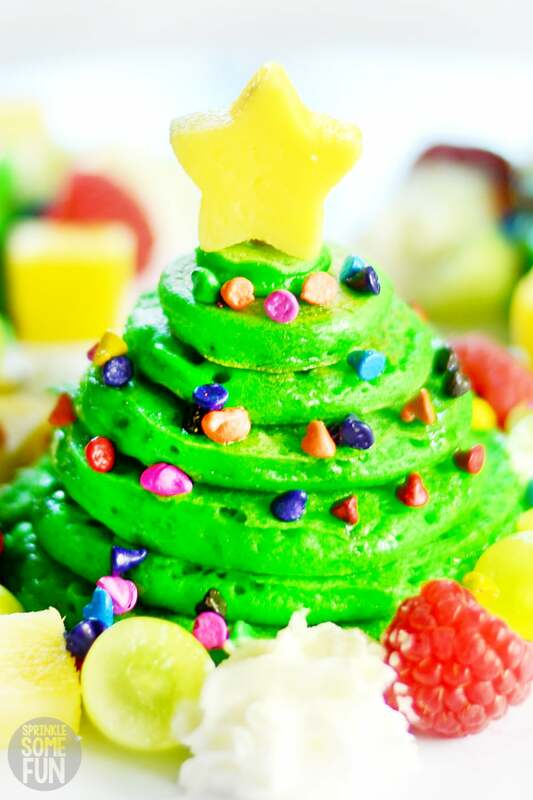 Put the fruit around the base of the tree with a few dollops of whipped cream. Add the mango star to the top with a toothpick. Next drizzle with the Aunt Jemima Original Syrup and then add sprinkles.